The Park Creek Station Wetland Mitigation Bank site was selected because we believe there is an excellent and unique potential to improve wetland, riparian and stream functions on a site with significant natural, cultural and open space values. Located where Park Creek punches through the Park Creek Hogback, the site has excellent restoration potential of wetland, riparian and stream resources of the type that are increasingly scarce along the northern Front Range, where most streams of this sort no longer have their natural flows or follow their natural stream course. 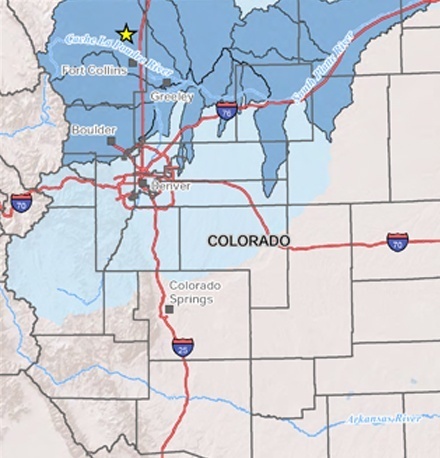 This proposed wetland mitigation bank located in Larimer County, Colorado, approximately 12 miles north of Fort Collins and west of Interstate 25. The approximately 640-acre parcel would restore and manage approximately 505 acres of wetland, riparian and buffer habitats along 1.25 miles of Park Creek and would provide wetland mitigation credits to offset wetland impacts in the Cache La Poudre and adjacent watersheds. The proposed primary service area stretches across much of north-central Colorado and encompasses the Cache La Poudre (HUC 10190007), the Big Thompson (HUC 10190006), St. Vrain (HUC 10190005), Lone Tree-Owl (HUC 10190008), Crow (HUC 10190009), Pawnee (HUC 10190014), Middle South Platte-Sterling (HUC 10190012), the Little Dry Creek-South Platte River (HUC 1019000306), Outlet Box Elder Creek River (HUC 1019000308), Sanborn Draw-South Platte River (HUC 1019000310), Greasewood Draw-South Platte River (HUC 1019000311), and the Cottonwood Draw-South Platte River (HUC 1019000312). The landscapes within the primary service area shares similar characteristics, climate, soil types, vegetation and wildlife, special status species and critical habitats. The proposed secondary service area is the remaining South Platte HUC 6 outside the primary service area inside Colorado. Interested in learning more about the Park Creek Station Wetland Mitigation Bank and the mitigation credit types available? Please submit this form with your contact information and any relevant details, and we will be in respond promptly to discuss your needs.